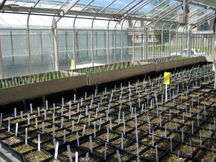 C. Roberts, S.C. (2012) Contribution of taxane biosynthetic pathway gene expression to observed variability in paclitaxel accumulation in Taxus suspension cultures. Biotechnology Journal 7: 418–427. New paper from the lab! Analysis of yellow striped mutants of Zea mays reveals novel loci contributing to iron deficiency chlorosis. The new PB students have arrived!